Fish tends to spoil fast, even when kept on ice. So to ensure that farm-raised salmon remain at peak of their freshness (read: still swimming) for whole trip to back to shore for processing, Rolls-Royce is building the world's largest mobile aquarium/meat wagon. Aquaculture, especially the open-water variety, is quickly gaining traction as a sustainable alternative to traditional fisheries. But the further off-shore these fish farms move, the longer it takes to get them back to shore for processing and the greater chance there is for spoilage. Sure, you could put the fish on ice for the trip but with individual harvests topping 450 tons of ichthyoid, keeping them cool for that long gets expensive fast. Instead, the new Rolls-Royce type NVC 386 tanker will keep its charges alive during transport, storing them in massive below-deck pens. 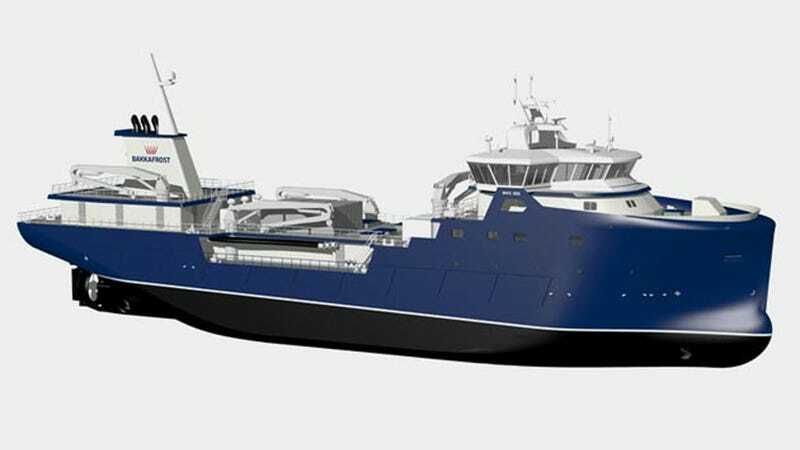 The $9.4 million 250-foot long, 52-foot wide vessel is currently being constructed at the Tersan shipyard in Turkey and is on schedule for delivery to the Bakkafrost fish farming company in May 2015. It has a roughly 9,800 cubic foot (3,000 cubic meter) carrying capacity, enough to pack in 450 tons of salmon into a trio of closed circuit, water-recirculating, lice-filtering holding tanks. Loading and unloading the fish is accomplished by hoovering them en mass out of their off-shore pens through 2-foot wide plastic tubes, then spewing them back out once the ship reaches shore.